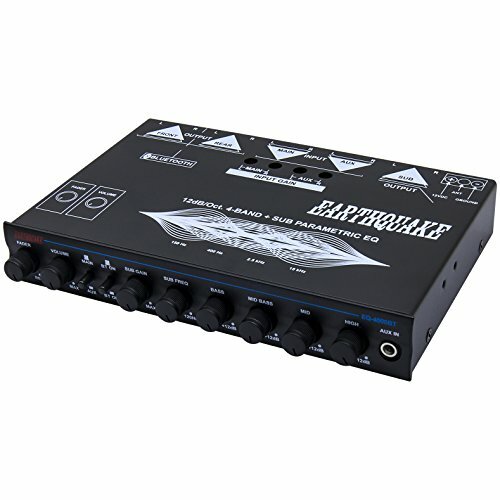 Earthquake's EQ4000BT 4-band equalizer includes Bluetooth capability, making it easier to start enjoying your favorite playlists from your Bluetooth-enabled devices (including iOS and Android devices) to the vehicle's audio system. With the new EQ4000BT, you can keep your device with you at all times, reducing the risk of forgetting the device in your vehicle. The EQ4000BT features fully retractable controls, blue background LEDs, 4 input sources (RCA, AUX, mini jack, and Bluetooth), a 9V RMS output. It is ideal for use in tour or party buses, limousines, and other commercial vehicles.